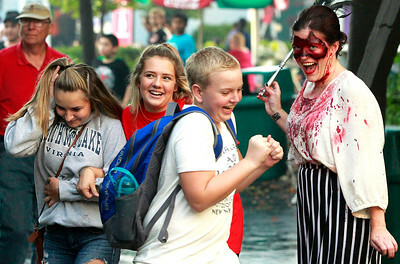 Candace H. Johnson-For Shaw Media Chase Brentman, 16, of Antioch has his face airbrushed by makeup artist, Mike Maloney, of Justice, to look like an infestation ghoul during Fright Fest at Six Flags Great America in Gurnee. 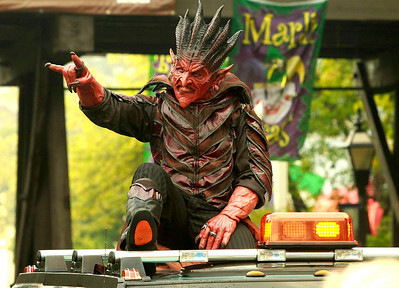 Candace H. Johnson-For Shaw Media A ghoul walks in the Uprising Parade during Fright Fest at Six Flags Great America in Gurnee. Candace H. Johnson-For Shaw Media Katie Kazumura, of Palatine is transformed into a werewolf by makeup artist, Beth Zwolski-Tobias, during Fright Fest at Six Flags Great America in Gurnee. 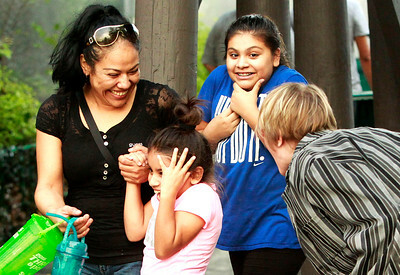 Candace H. Johnson-For Shaw Media Carmina Martinez, of Chicago and her daughters, Kathy, 8, and Karen, 12, react to a masquerade ghoul as he greets them during Fright Fest at Six Flags Great America in Gurnee. Candace H. Johnson-For Shaw Media Scary clowns walk in the Uprising Parade during Fright Fest at Six Flags Great America in Gurnee. 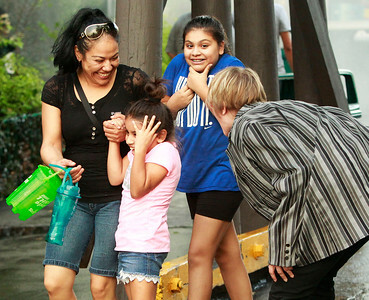 Candace H. Johnson-For Shaw Media Paityn Czechowicz, 13, Molly Wichert and Gabriel Ross, both 14, all of Racine, Wis., are greeted by a masquerade ghoul during Fright Fest at Six Flags Great America in Gurnee. 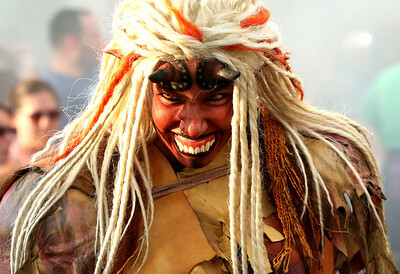 Candace H. Johnson-For Shaw Media Nox, the demon overlord of Fright Fest, greets the crowd during the Uprising Parade at Six Flags Great America in Gurnee. Candace H. Johnson-For Shaw Media Nox, the demon overlord of Frightfest, rises above the zombies during the Uprising Show at Six Flags Great America in Gurnee. 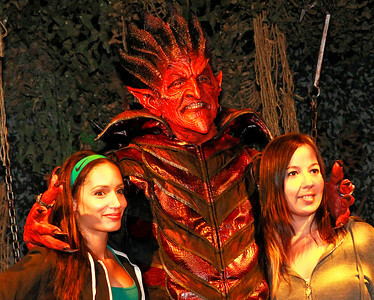 Candace H. Johnson-For Shaw Media Nox, the demon overlord of Frightfest, takes a photo with Isabel Samano, of Round Lake and Michelle Nowak, of Lake Villa during Fright Fest at Six Flags Great America in Gurnee. 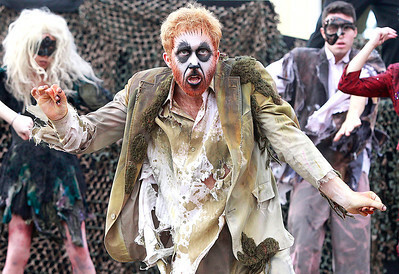 Candace H. Johnson-For Shaw Media Zombies entertain the crowd before the Uprising Parade during Fright Fest at Six Flags Great America in Gurnee. 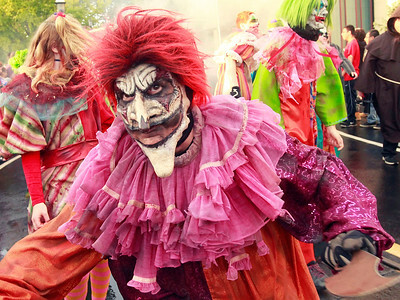 Scary clowns walk in the Uprising Parade during Fright Fest at Six Flags Great America in Gurnee.